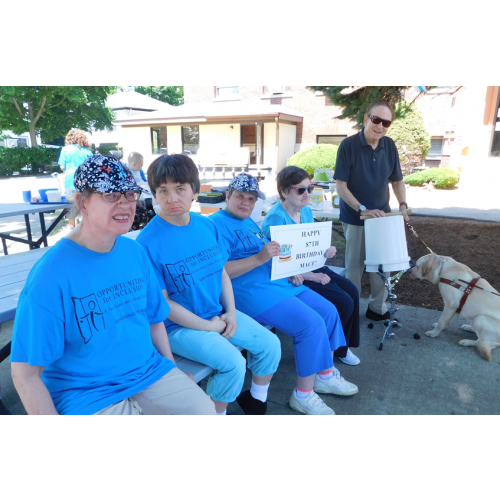 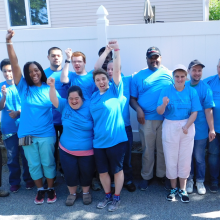 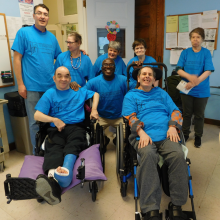 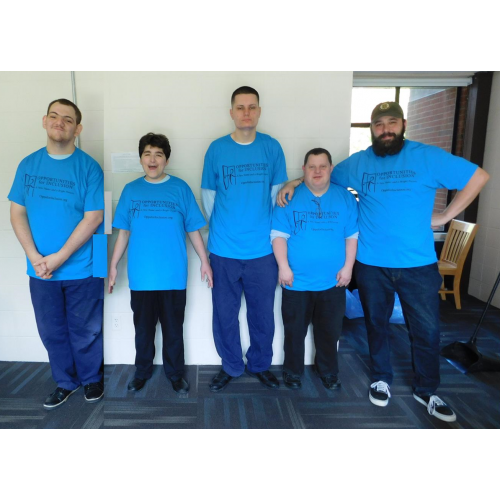 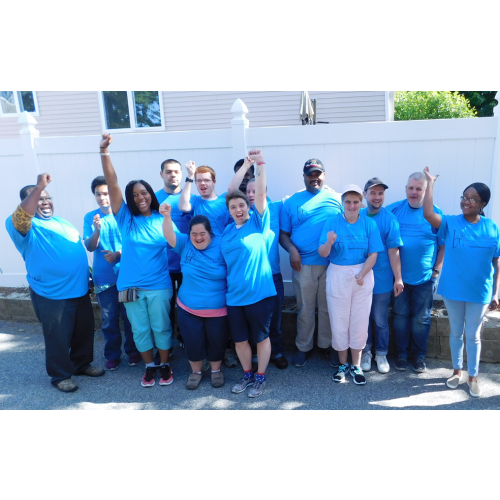 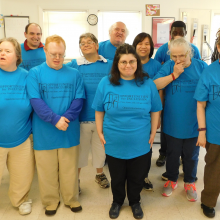 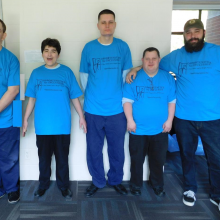 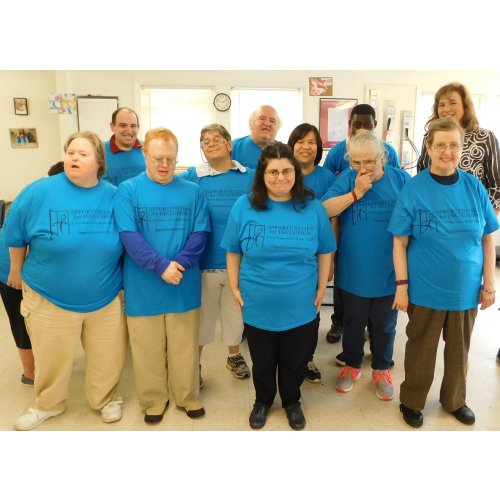 Participants and staff of our Community Based Day Supports (CBDS) program gather with Roz Rubin, CEO, to show off their new Opportunities for Inclusion t-shirts. 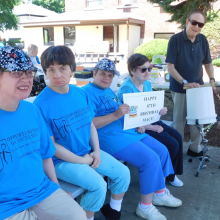 Day Hab participants wish Mace Miller a Happy 87th Birthday! 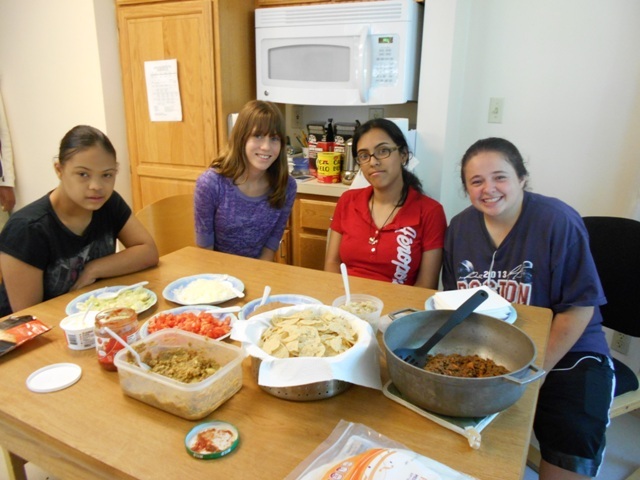 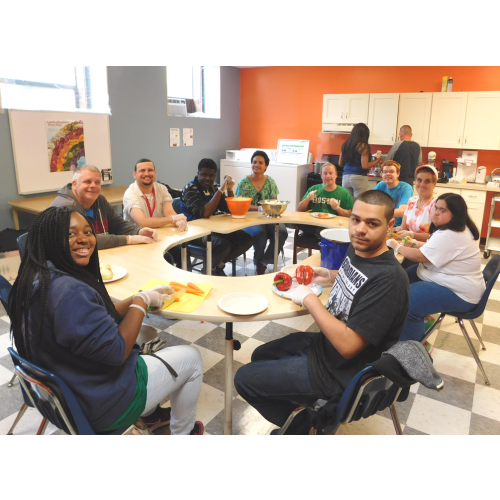 Cooking is part of the Group Supported Employment’s Semester Break Program curriculum.They shopped for the ingredients and enjoyed a delicious lunch! 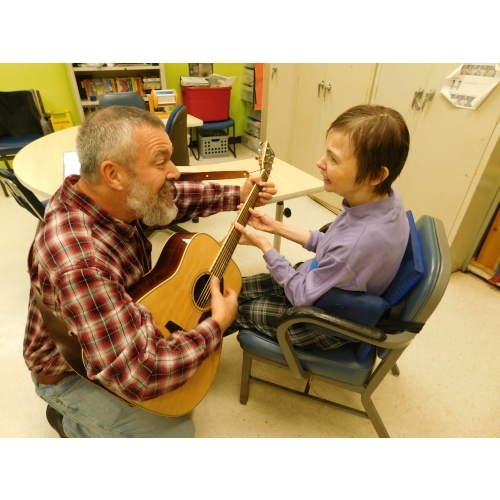 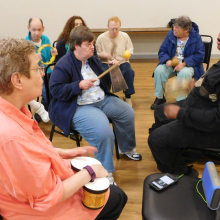 A music session with CBDS participants in the Boys & Girls Club’s music room. 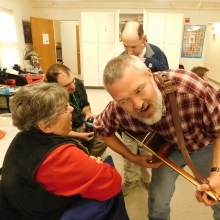 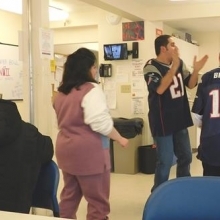 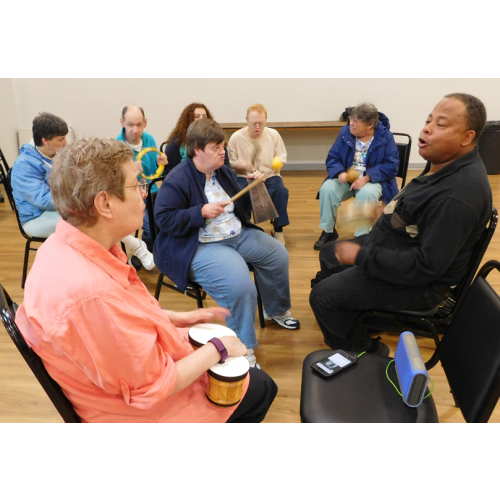 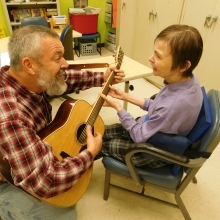 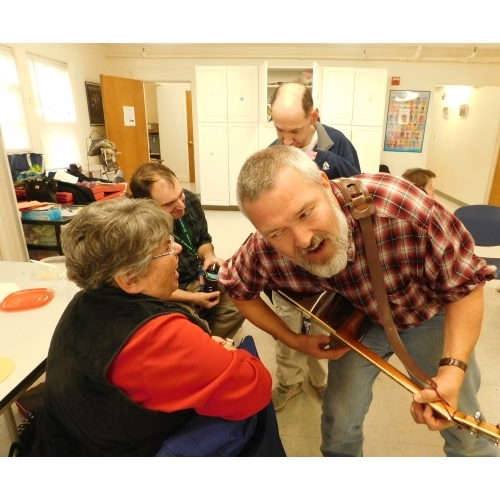 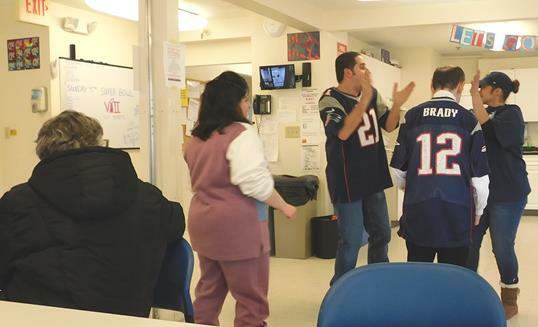 Participants and staff enjoyed a rousing pre-Super Bowl Party. 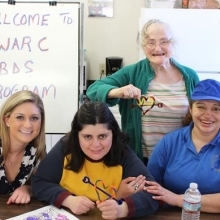 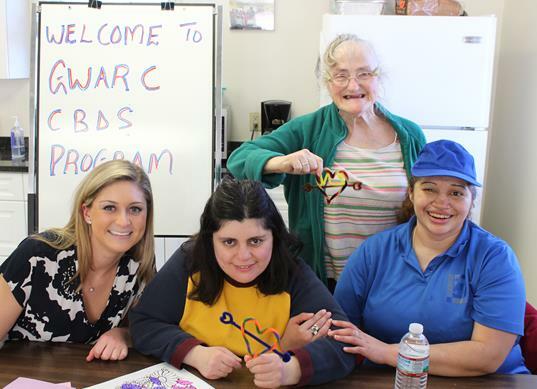 Making Valentine crafts with Bentley Service-Learning student volunteers was a fun February project. 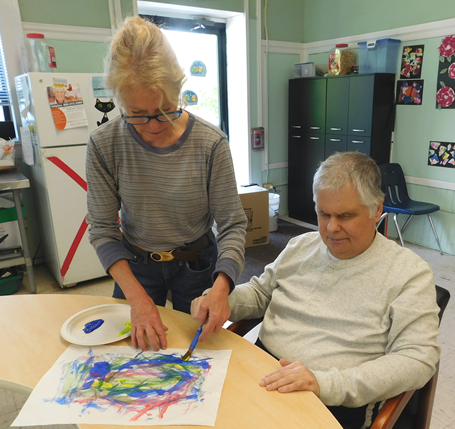 Carolyn Melbye, art therapist with ARTrelief (left) and Tanya Brown, DD Assistant (center) assist Tommy R. to add his touch to a painting by dripping paint. 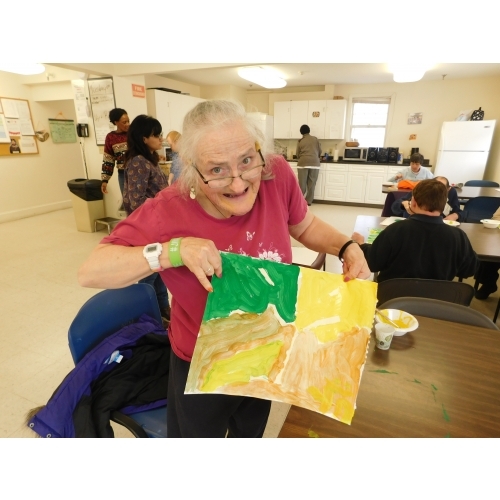 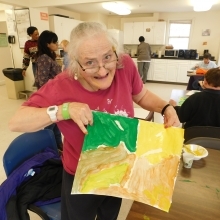 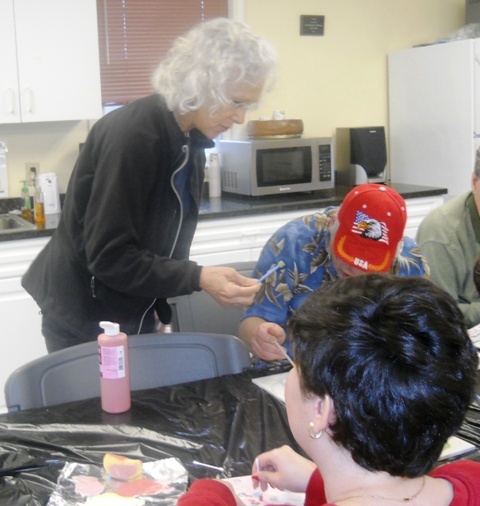 Melissa Kulig conducts an art class with participants at Chestnut Street. 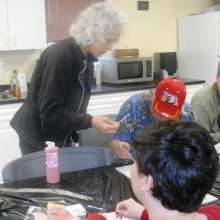 Phyllis Biegun teaches a ceramics class to individuals at our Woodland Road location. 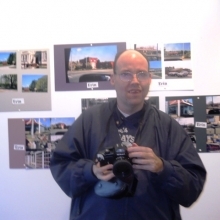 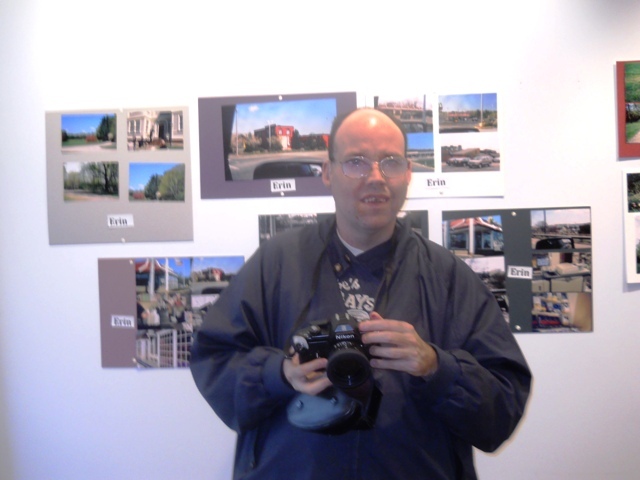 Erin Willfong posing next to photos he took with a photography class. 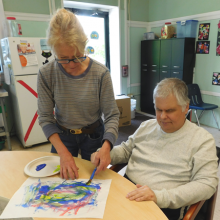 Tommy proudly displays art work her created with a Bentley student volunteer in March, 2016. 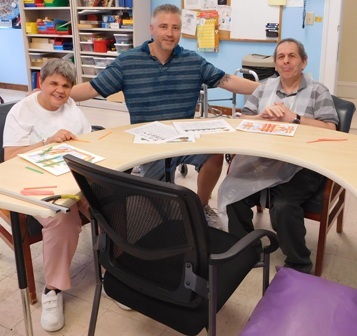 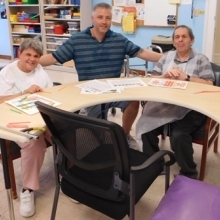 Artist Dan Dressler works with Michelle and Ken to create 3-D works of art exploring shapes. 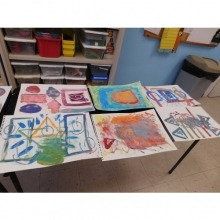 Art work is set to dry after an arts session with Artist Dan Dressler. 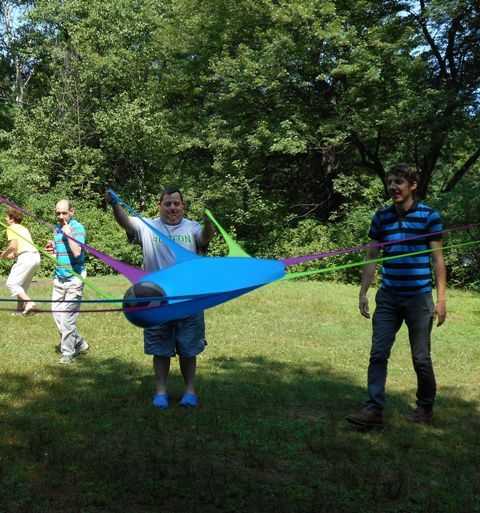 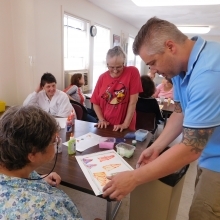 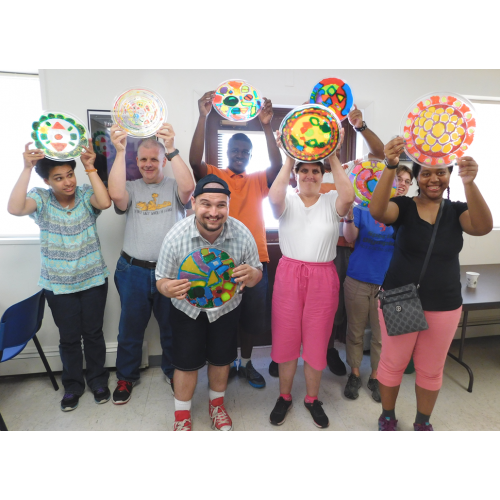 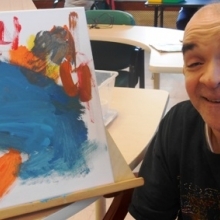 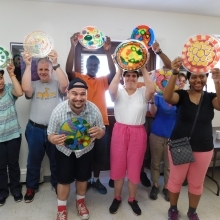 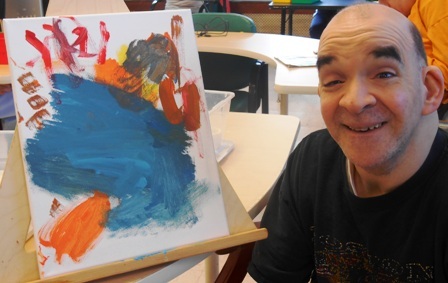 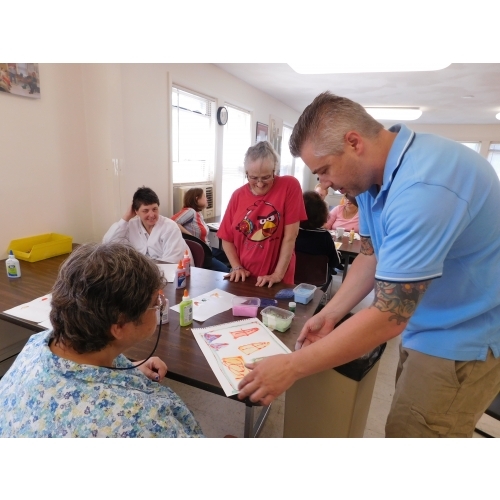 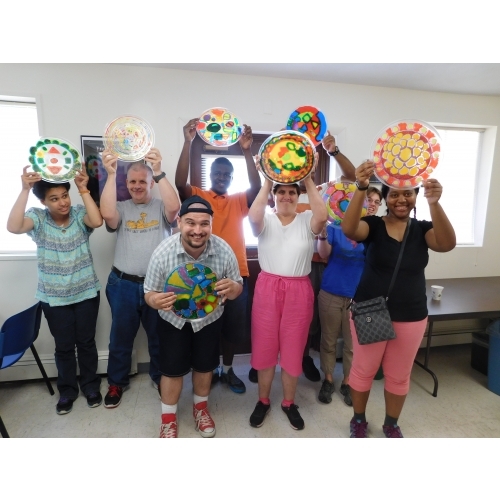 GSE participants show off their art work created in sessions with Artist Dan Dressler. 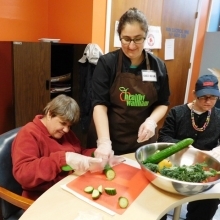 Mary Ann works with Chef Reva of Healthy Waltham to prepare a healthy meal at Chestnut Street. 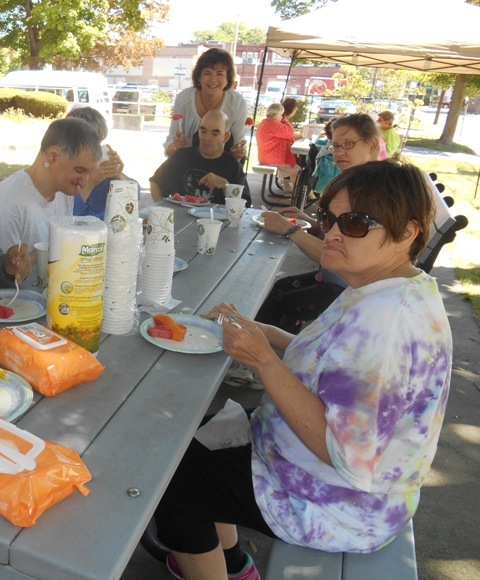 Michelle, Mary Ann and Cindy enjoy the delicious meal they prepared. 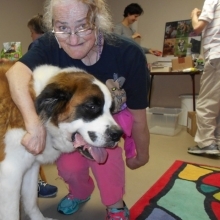 Yolande Nowlan visits with a friend while volunteering at Phinney's Friends, a non-profit dedicated to helping people feed and care for their pets. 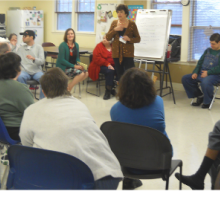 Day Education participants enjoy monthly Chair Yoga with instructor Beth Gold-Bernstein (Brahmi) of TriYoga Boston. 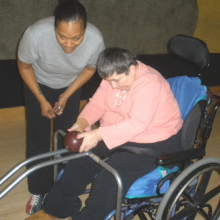 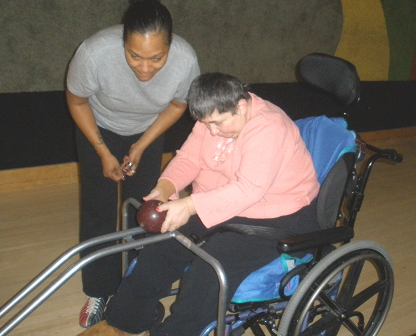 Cindy DeLeo tries adaptive bowling with Day Habilitation staff member Diana Lee. 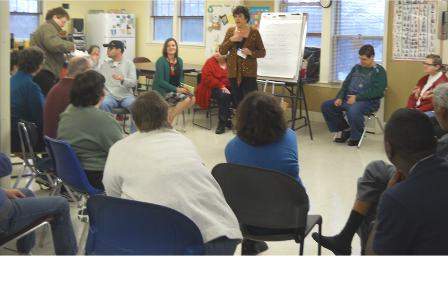 Participants ask questions at a CEO Town Meeting with Roz Rubin at Woodland Road. 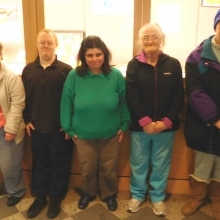 Melinda Nally and Inrick Philogene delivering Valentine cookies to staff members at 56 Chestnut Street. 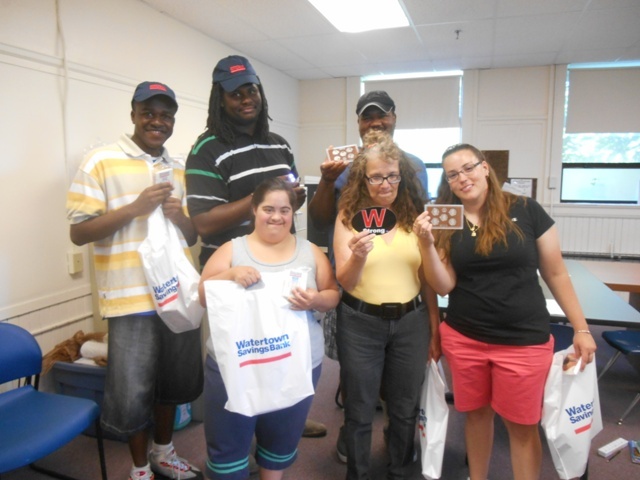 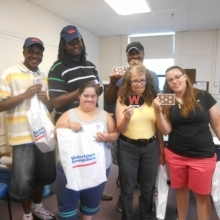 GSE participants and staff display items they received during a tour of Watertown Savings Bank. 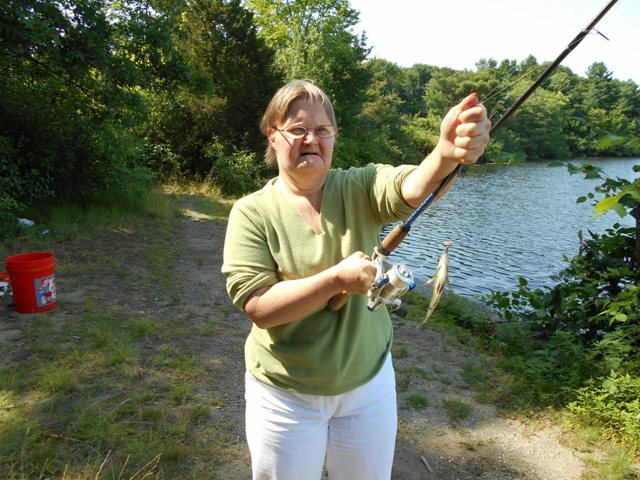 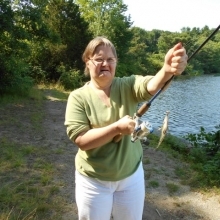 PLUS Participant Charlene Craig shows off a fish she caught during a group fishing trip. 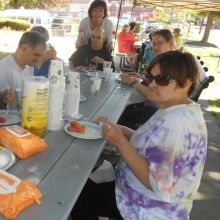 Day Education participants enjoy a summer cookout under the shady canopies. 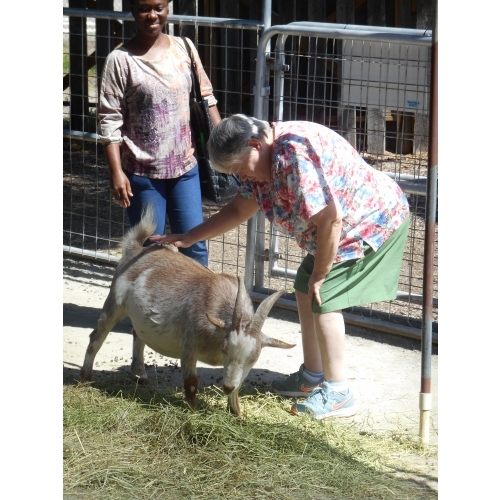 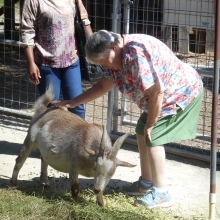 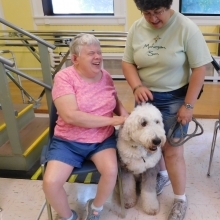 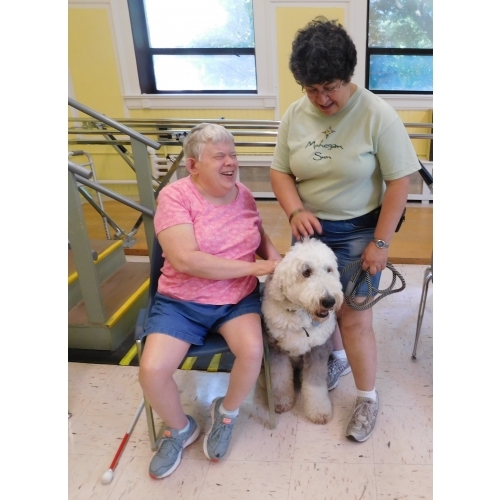 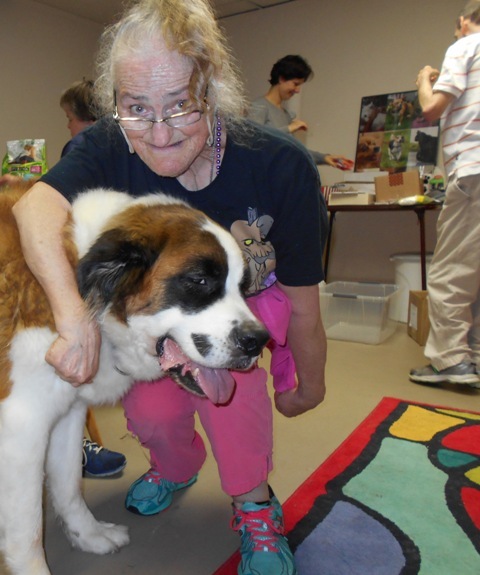 Dianne and Ashley enjoying our Pet Therapy program in July. 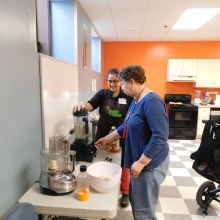 Michelle Reva and Mary Ann cooking with Healthy Waltham in March. 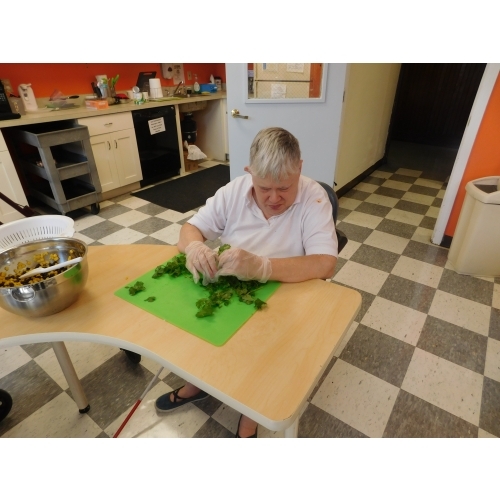 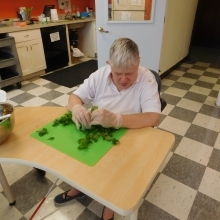 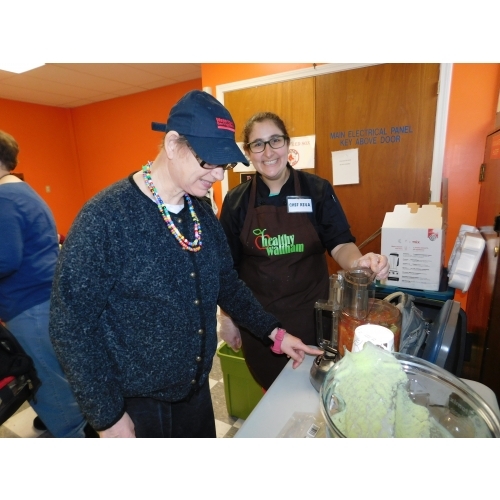 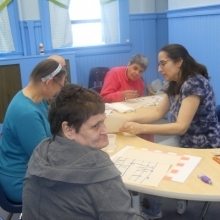 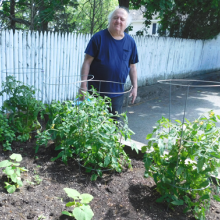 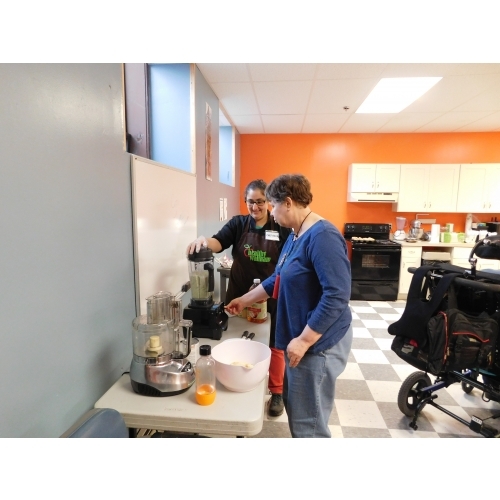 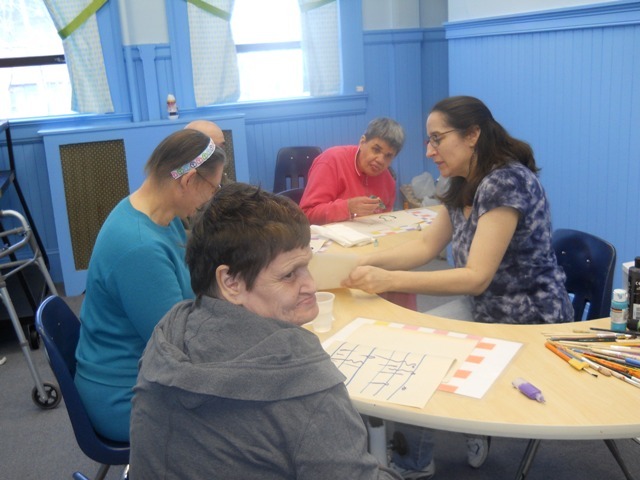 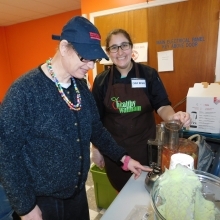 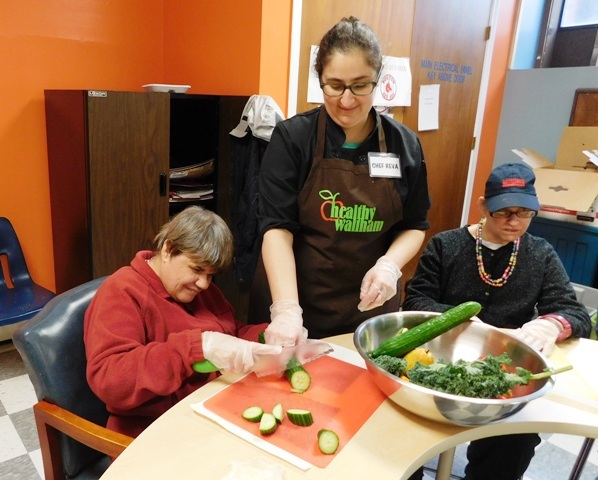 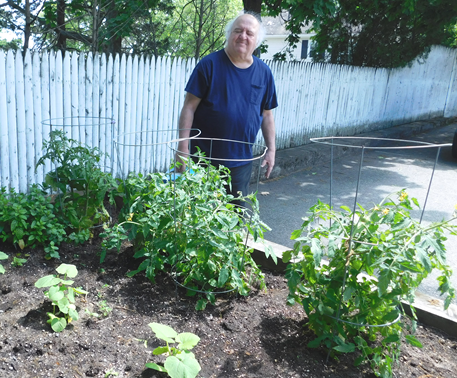 Cindy works with Chef Reva of Healthy Waltham to prepare a healthy meal at Chestnut Street. 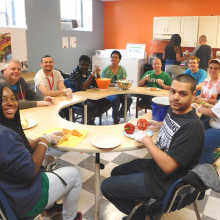 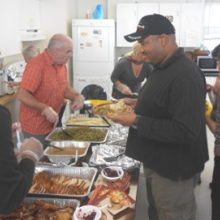 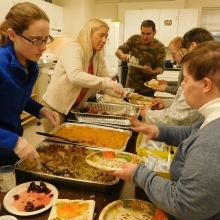 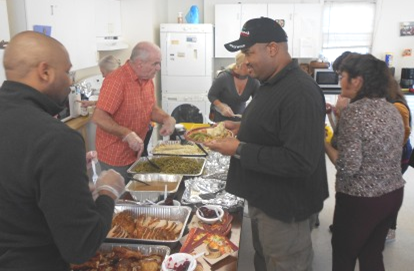 Staff members and volunteers serve a delicious pre-Thanksgiving dinner to CBDS and GSE participants at Woodland Road in November. 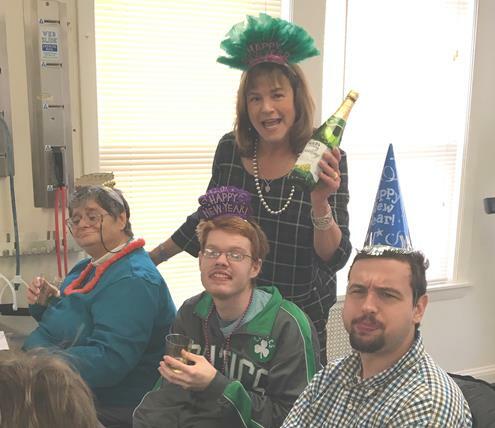 Participants and staff meet in January to discuss the FY18 Accessibility Plan. 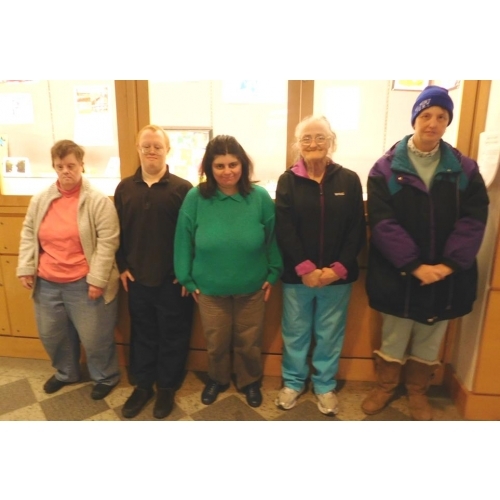 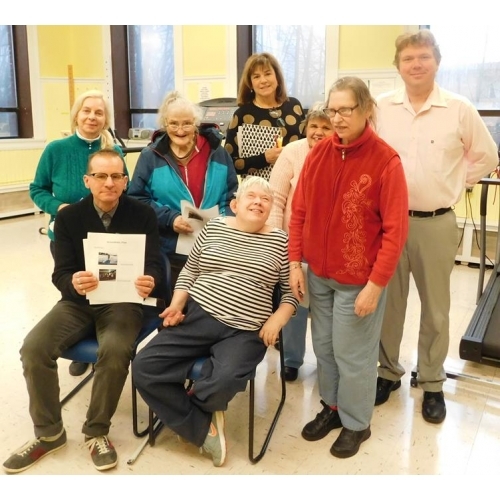 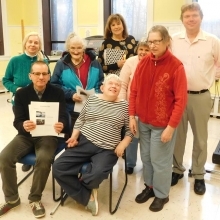 CBDS participants gather in front of the Artists of GWArc art display they helped set up at the Waltham Public Library. 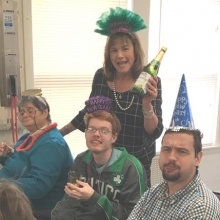 New Year’s Eve came early with party hats and celebrations at Chestnut Street and Woodland Road on December 29. 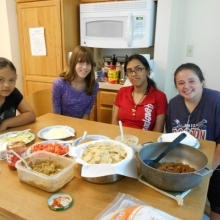 We celebrated Chinese New Year in February. 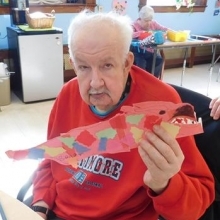 Brian Doucette displays the paper dragon he crafted. 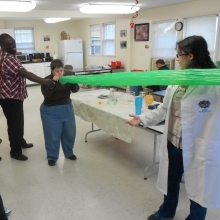 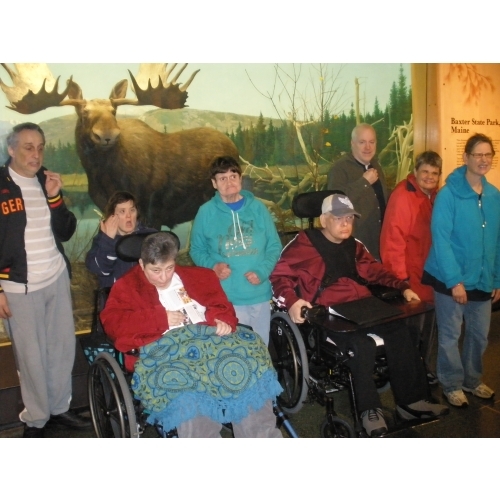 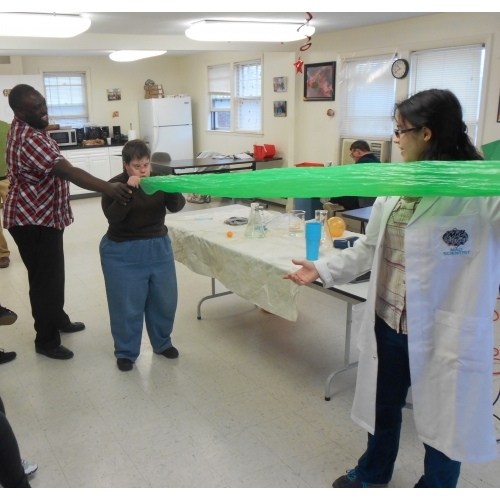 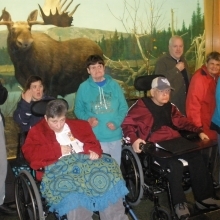 Day Habilitation participants and staff visit the Museum of Science.